Earlier today a Senate Judiciary Sub-Committee considered and approved Constitutional Carry legislation (S.F. 2106) for Iowa! This is a fantastic step forward for this bill, which now goes to the full Senate Judiciary Committee. The committee needs to approve this bill by NEXT THURSDAY for it to remain alive for this session. In the coming days, we’ll be urging you to email and call the members of the Senate Judiciary Committee to insist that they advance this bill. Please stay tuned for this call to action! As this bill continues to advance, anti-gun pressure is heating up. Earlier today, lobbyists representing NYC billionaire Michael Bloomberg and Washington D.C. based Gabby Giffords were testifying in opposition to Constitutional Carry! Of course these are people who enjoy security details to provide for their safety — with guns! But they have no problem trying to come into Iowa and telling Iowans that you shouldn’t have the same protections that they enjoy. That’s why we’ll be asking you to contact the Senate Judiciary Committee early next week! As you no doubt already know, Constitutional Carry isn’t a dangerous bill. It’s not the end of all gun laws. It’s not the end of reciprocity. This is the same Second Amendment freedom that gun owners in THIRTEEN OTHER STATES currently enjoy, and that is being considered in another dozen states this session. Iowa was one of the last states to do away with our abusive ‘May Issue’ carry system, and we were the 36th state to enact Stand-Your-Ground law. Let’s not wait around and be one of the last states to secure Constitutional Carry protections for gun owners — not while we have the votes to get this done! 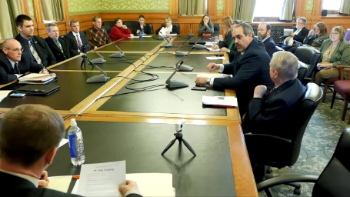 Finally, if you’re not a member of Iowa Gun Owners, we need your support as we prepare for a massive ad blitz in anticipation of a floor vote. If you are a member, we can’t thank you enough. Please consider a special contribution to help us continue to advance Constitutional Carry! P.S. Earlier today the Senate Judiciary Sub-Committee passed Constitutional Carry legislation on to the full Judiciary Committee by a 2-1 margin! Thank you to everyone who called, emailed or showed up in person in support of this bill. The bill now has to pass the Senate Judiciary Committee by next Thursday to remain alive. Get ready to pour on the calls and emails next week! And if you’re not yet a member of Iowa Gun Owners, we need your support — so please join and get involved TODAY!